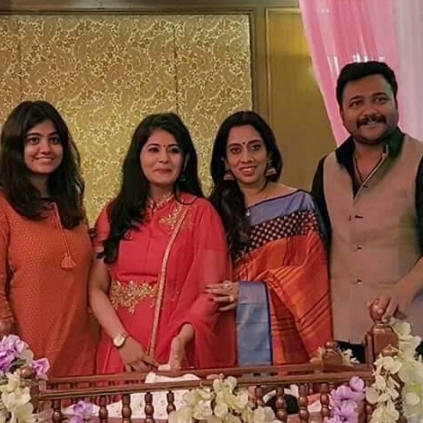 We had reported a few days ago that Bobby Simhaa and Reshmi Menon were blessed with a baby girl. The naming ceremony for the little one was conducted recently and their bundle of joy has been named as Mudhra which could mean a symbolic gesture. Sharing this news, the National Award winning actor posted in his social media page, “Feeling blessed and super proud of our little baby girl "Mudhra Simha". Thank you for all ur wishes”. The function was attended by close friends of the couple that included music composer Santhosh Narayanan’s wife. A film which was supposed to have Vijay as the hero, now goes to this star? James Bond girl passes away! Siddharth's strong and bold statement on BJP's stand! Simbu to dance among 80s mass heroes? People looking for online information on Bobby Simhaa, Reshmi Menon will find this news story useful.